This is the third day in a row that we've had a heat advisory here, so it is perfect weather for doing some stitching. The weather service alert says that afternoon and early evening temperatures will be in the lower to middle 90s, with maximum heat index values around 105 degrees. They say to put off all strenuous activities. They don't have to tell me twice: the vacuum cleaner is parked in the closet, the stove is off, and I'm sitting in the air conditioning with my needle, thread and hexagons. I have a lot of 1" hexagons basted, so I have been making more of these double hexagons. I usually baste 6 hexagons from one fabric, and I usually find something that I think would look good fussy cut. Sometimes if I find a fabric that I really like, I'll baste 12 from the same fabric. A lot of the time, two of the fabrics I use come from the same fabric line like the two purple fabrics. The red stripe was just in the container. 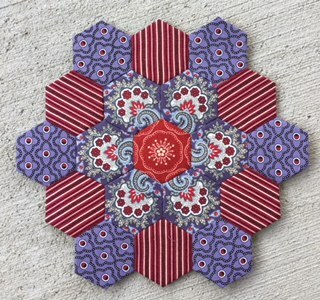 When I find a fabric like I used in the first two centers, I baste several of these because I think the center hexagon makes it look like a flower. The inner floral fabric and the blue stripe are cut from the same piece of fabric. The brown wavy is from the Lewis & Clark line by Barbara Brackman. I still have some of it left, and I use it sparingly. I love that fabric! This is my container of basted 1'" repro hexagons. You can see I've used snack bags to group more of these double hexagons. I have another container just like this with bright 1" hexagons. 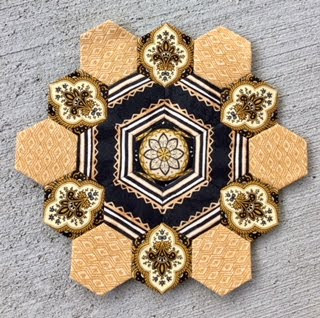 In the afternoons, I usually pour a glass of iced tea and take a basket of hexagons to stitch out to the porch for awhile. These are the hexagons for the Rose of Kaleigh sew along by Sue Daley. I think there are 52 of these 3/4" hexagons. The ones on the right are complete with the center. The pile on the left still needs to have the center sewn in. By the way, I have switched to these Tulip #9 Sewing Needles to do my English Paper Piecing, and I think they are saving my hands. They are showing up in a lot of quilt shops and are available on line. I had 17 of these bright hexagons finished and some more cut, and I wasn't sure what I would do with them. My friend, Michele, showed me a photo of a hexagon quilt in the June issue of American Patchwork and Quilting magazine by Sherri McConnell of A Quilting Life blog. Her hexagon quilt uses 35 hexagons so I basted and stitched 18 more for the quilt. The background is 4 squares of low volume fabrics made into four patches, and I will hand applique' the hexagons onto the background. I think that will be a good summer project (yes....another one). Michele also got me started on these Lone Star quilts. They are made using a foundation by Quiltsmart. They have a light fusible on one side and are marked with placement and sewing lines. This was my first one, and I've kept going. 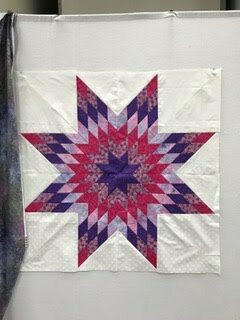 I even taught a group up in northern Indiana how to make this Lone Star quilt. 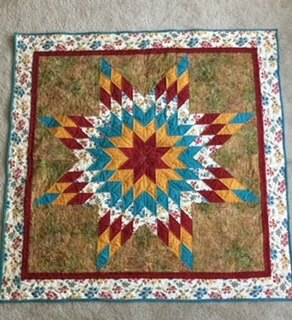 This one is 38" without the border. I used batiks on this first one because it's easier to concentrate on the technique and not worry about getting the fabric upside down. This was my second Lone Star. I love this one in fall colors. The fabrics were given to me by my friend, Barb. I just love the border print. This is the Little Lone Star at 19". Michele gave me this bag to carry quilts in. These are really Laundry bags, but they are great for taking quilts to show and tell or packing a lot of "stuff" to go to a retreat. In order to cover the word laundry stitched on the bag, I covered it with a 6 pointed star left over from my quilt. This is the 38" Lone Star made by one of my students, Kim. She invited me to come up to Hebron, Indiana, to sew with her group for the day and teach them the Lone Star. 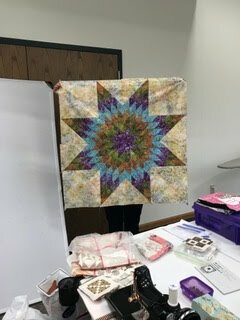 Pam brought hers along to the Jane Stickle retreat in Shipshewana, and she finished it while she was there. Judy was almost finished with hers, too. I didn't get a photo of her progress. This is my Pretty Plates quilt. 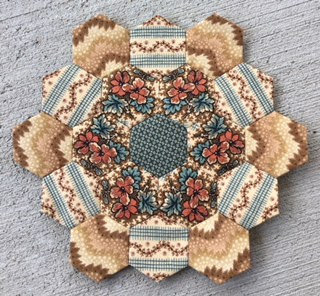 Theses blocks are English Paper Pieced, and the pattern is by Annette Williams of Sewing the Good Life. These blocks have very little hand sewing and are appliqued' down to the background. I added broderie perse flowers in the centers of my blocks using fabric by Di Ford, and I machine quilted it. I know this looks like a lot, but I did a trunk show for the Evening Star Quilters in Columbus, Indiana. That is always a good motivator to finish quilts. I hope you are still reading because I have seen several of my favorite bloggers ranting talking about the problem with Blogger Comments. Not long ago, I found out that I was only getting part of the email notifications when someone left a comment on my post so unless I went to my own blog post, I didn't see those comments that were left. I went in and toggled and untoggled my settings to get it to work. Today, I was reading Fun with Barb's blog, and she says this is just the way that it's going to be. It's a change and not a problem with Blogger. One way around this is for me to post and then put down the first comment and then the rest of the comments will come to my inbox (I think). But, if I don't know your email address then I won't be able to email you back. I'm not sure what their thinking is with this. I have been told that I should reply down below the person's comment. After I've read a blog and comment, I hardly ever go back to a blog again until their next post. How about you? I'm going to link with Judy over at Small Quilts and Doll Quilts for Design Wall Monday. Long post. This is an experiment to see if comments will come to me via email. You have some really pretty projects you are working on. Hope you have a nice summer! 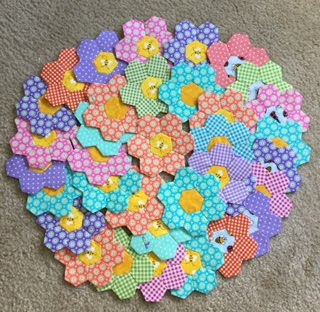 I noticed that you are in the Facebook group that is making hexagons....can't think of the name of the group at the moment. I joined last week. I have loved seeing hexagon pieces for a long time that others make but have not been tempted to make them myself. Well, I am going to give it a whirl. I ordered both 3/4" and 1" hex papers (Sue Daley brand). I see you are using 1" but in the group survey, most were doing 3/4". I have no idea which is a better size to work with. I like how you fussy cut for the hex flowers and will try that. I have been clicking on a person's name when they leave a comment and it often takes me to their blog. Then I click on info and it takes me to the part of the blog where you can click on email address. I reply to them that way. But that only works if they have signed up for a blog. Otherwise, if I don't have their e-mai address, I can't reply. I don't worry about whether comments are coming to my e-mail. I check my blog comments at least once a day and do what I can to reply to the person. 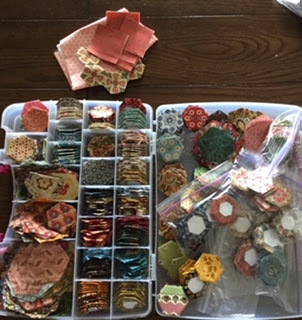 I can't believe how many hexies you have made. Sewing them together is hard on my hands so I have to take breaks. No need to write me back. I don't go back to see if the blogger has responded to my comment. I always enjoy seeing your fussy-cut hexies. So pretty! Such lovely Lone Stars! 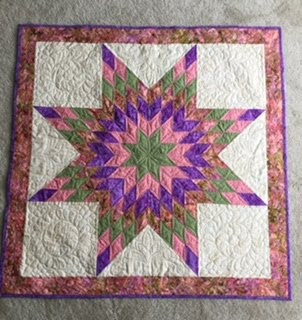 I have the Quiltsmart foundation for the small one, but I need a shot in the arm to actually get started on it! I saw that post from Barb, but I have also been to the Blogger Help forum where someone from the Blogger team says it is a problem they are aware of and they are working on fixing it. That was back on May 25th. Nothing more since then. I rarely go back to see if someone replied to my comment on their blog. Don't have time to keep returning to blog posts I have already read. Try this fix for your missing emails about comments. It worked for me and a lot of my friends, and it's so easy. I just discovered your blog and love it! You are really productive, but it’s obvious you enjoy the process as much as the finishes! Thank your for your thoughtful and descriptive writing. You are still, and will forever be, the queen of hexagon fussy cuts!